During the ensuing years, Dehgewanus learned the Seneca ways, and took a husband, Sheninjee. A little girl was born to them in the summer of 1761, but died soon after birth. Before the next spring she gave birth again, this time to a son who she named Thomas after her father. The following summer, with her baby in the cradleboard on her back, Dehgewanus and Shenijee started a remarkable journey. Shenijee was worried that the end of the war would mean a return of captives, and it was possible that he might lose his young wife. The couple decided to go to his homeland along the Genesee River in western New York. The journey was long and hard, almost seven hundred miles by the route they took. In the dead of winter, Dehgewanus finally reached the Genesee Valley, but without Shenijee. He had left her to hunt and trap, and took ill and died. Dehgewanus, now a widow, was in a strange land. But Shenijee’s clan relatives soon made a home for her and her infant son at Little Beard’s Town near present day Cuylerville, New York. 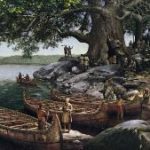 This was the heartland of the Seneca People, keepers of the Western Door of the Iroquois League, and life along the Genesee was good. That peace was shattered by the Revolutionary War. The Seneca and several other tribes sided with the British, and became targets of the American Army. Hiokatoo was a leader in the Cherry Valley Massacre of November 1778, and in 1779, George Washington sent an army of five thousand soldiers to destroy the Seneca’s will and ability to fight. Their main target was Little Beard’s Town. The Seneca hoped to stop the invaders with a well laid ambush, but despite losses, the Americans reached the Genesee Valley and began to burn the fields and homes of the inhabitants. As the enemy approached, the Seneca fled into the forest. Dehgewanus decided to go to the abandoned village of Gadaho to the south. There she and her children found shelter with two runaway slaves. Along the banks of the Genesee, Dehgewanus returned to her Seneca ways. Hiokatoo found her there and together they rebuilt their lives. For nearly twenty years, they lived there until the white man invaded once more. This time the invading army was made up of land speculators and pioneers. 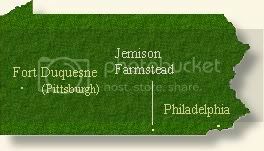 A great council was held near present-day Genesee, New York, in the late summer of 1797. All the Seneca leaders were there, along with the women who would advise them. The negotiations were long and difficult, and the resulting treaty pleased few. In return for twelve reservations and payments, much of the Seneca homeland was turned over for sale to settlers. One of those reservations included the lands where Dehgewanus and her family lived. She journeyed to the council, and was able to get some lands set aside. She owned the largest herd of cattle in the region, and the tribal grant in 1797 made her one of the largest landowners. Title to the land was confirmed by the state in 1817, in which year also she was naturalized. Although the Seneca still had land to grow corn, beans, and squash, many who remained in the Valley found themselves struggling to survive in an increasingly white world. Dehgewanus paid a heavy price – the pressures and tensions of the times took three of the Jemison boys, all three murdered between 1811 and 1817. Most of her neighbors, however, respected the Seneca woman they called the Old White Woman of the Genesee. They knew that no one in need was ever turned away from her cabin door, and they looked forward to the times when she came to their little cabins for tea and cakes. She was noted for her generosity, cheerfulness, and a vigor that remained with her into her 80s. Some local residents encouraged a doctor and writer to talk with the Old White Woman. The interview took place in November of 1823 at a place called Whaley’s Tavern. The next year, a little book titled The Life and Times of Mrs. Mary Jemison was published. In 1823, the Seneca gave up the Gardeau Reservation lands, reserving two square miles for Dehgewanus. She lived there in a log cabin until 1831, when white settlement in the area had grown past her comfort level. She sold that land, and moved to the Buffalo Creek Reservation. There Two Falling Voices / Dehgewanus died on September 19, 1833, at the age of 90. Forty-one years later the Old White Woman returned to her Valley. The Buffalo Creek Reservation had been sold, and the old burying ground was threatened. Dehgewanus’ grandchildren approached William Pryor Letchworth, a local businessman and landowner, and asked for his help. Letchworth immediately invited them to bring the bones of their grandmother to his Glen Iris Estate. Letchworth had worked to preserve the native history of the Valley. He created the Council Grounds on his land on a bluff overlooking his estate, and moved the ancient Seneca Council House and a Gardeau cabin to the Grounds. For this work, the Seneca People honored him with the name Hai-wa-ye-is-tah, he who does the right thing. In March 1874, the remains of Dehgewanus were removed from her original grave, placed in a new walnut coffin, and brought to the Genesee by train. In ceremonies held in the ancient Council House, Dehgewanus was buried on the Council Grounds on a bluff above the Middle Falls. Mr. Letchworth erected a granite marker at her gravesite not long after the reburial. 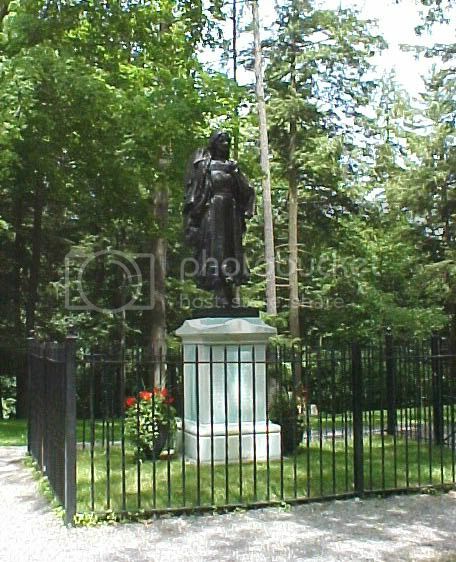 On top of the marker is the Mary Jemison statue that Mr. Letchworth dedicated to her memory in 1910. It depicts a young Dehgewanus with Thomas on her back making the long trek from the Ohio to the Genesee Valley – an unforgettable journey in the life of a remarkable woman who walked in two worlds. Indian captivity narratives are stories of men and women of European descent who were captured by Native Americans. They were popular in both America and Europe from the 17th century until the close of the American frontier late in the 19th century. Captivity narratives frequently contained fictional elements as well, and some were created because the stories were popular. As a result, historians treat captivity narratives with caution, and many of them are regarded more as folklore than history.